Polycystic ovary syndrome, or PCOS, affects as many as 5 million women in the U.S., according to the Office on Women's Health at the US Department of Health and Human Services. It has no cure, and treatment involves managing symptoms to prevent health problems. Hormone imbalance is one of the primary problems in women with PCOS. Women with PCOS may supplement their diets with soy, a source of plant estrogen, to help improve hormone levels. But getting too much soy may affect fertility. Consult your doctor about soy and your health before making changes to your diet. The ovaries in women with PCOS produce more androgen -- a "male" hormone also produced by women -- than normal. High levels of androgen affect a woman's ovulation and egg development and increase risk of infertility. In fact, PCOS is the most common cause of infertility in women, according to WomensHealth.gov. Phytoestrogen in soy food acts somewhat like estrogen in your body. Adding phytoestrogens to your diet may improve hormone levels, as well as lower risk of heart disease and diabetes, according to a 2011 study published in the "Official Journal of Isfahan University of Medical Sciences." This quasi-randomized study looked at the effects of phytoestrogen supplementation in the form of Genistein -- the primary phytoestrogen found in soy -- capsules on hormone and lipid levels in women with PCOS compared to women with PCOS supplemented with a placebo. This study found an improvement in reproductive hormones and lipid levels in the women who supplemented with the phytoestrogen. The researchers suggest soy phytoestrogens may act as a treatment for women with PCOS. Getting too much soy may increase infertility in women. However, most of the data relating soy to infertility is based on animal studies. High intake of soy phytoestrogen affects reproduction and embryo development in rats. One human study found women given soy formula as infants had longer periods and more cramping during menstruation, according to a 2009 article posted on the Scientific American website. Although these finding are concerning, more research is necessary to know whether soy poses a real health threat. Despite the few negative studies, soy in moderation makes a healthy addition to your diet. 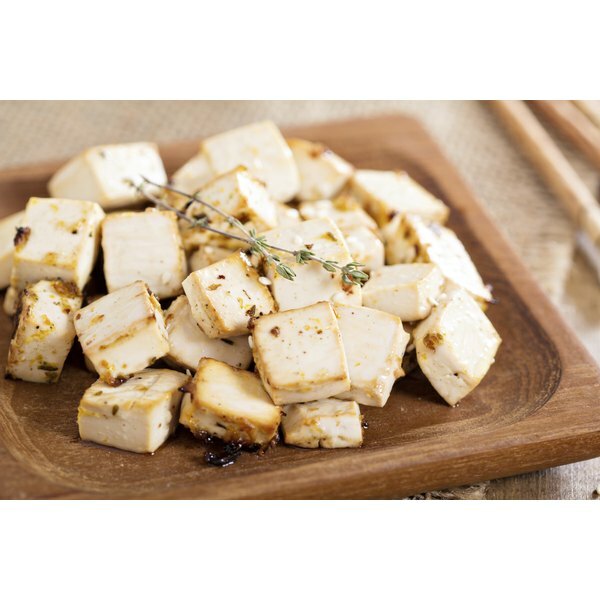 Food sources of soy include tofu, soy milk, edamame, soybeans, miso, soy sauce, tamari and soy nuts. You can easily add soy to your diet by making a few adjustments to your usual intake. For example, replacing your cow's milk with soy milk, eating a bowl of miso soup at lunch or snacking on a bowl of steamed edamame. You can also replace the meat in your usual stir-fry with tofu or tempeh. Scientific American: Could Eating Too Much Soy Be Bad for You? Vegetarian Diets: A Dietitian's Guide: Is It Safe to Eat Soy Foods?